Plans to expand retail presence and open 60 stores. V Mart is looking at a brighter future for the company as it files for an IPO. The retail company plans to raise money in order to expand and penetrate further into the Indian market. Lalit Agarwal,CMD, V Mart Retail Limited shares his plans in a candid interaction with Gunjan Piplani. Gunjan Piplani (GP): There is a lot that is going on V Mart’s end. How did IPO come in to being and its advantage? 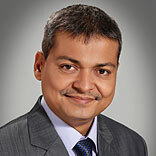 Lalit Agarwal (LA): We are a growing organization in the retail market. With the kind of growth we are looking at, investments are the need of hour. V Mart has 62 stores and off late we have grown strong in Tier I and tier II cities. There is a lot of potential for us to grow with consumer aspiration rising and people ready to spend. We as a structure are in a position to grow and this is the right time for its. GP: By when do we see the IPO being launched? LA: We have submitted our papers with SEBI once it gets approved, we will be decided upon the investment environment, the price and the date to launch the IPO. It will happen pretty soon. GP: What money do you plan to raise from the market and where will you invest it into? LA: We plan to raise Rs 100 - 120 crore from the market. When the organization is growing has to grow at all levels. So the money we will raise will go into various verticals including store manpower, backend manpower, SKU, warehousing and others. In terms of manpower we have 2500 employees and once we are over with our expansion we will have 5000 employees. GP: What are your retail expansion plans? LA: We are targeting 60 stores in next two and a half years, which means a total of 120-125 stores. We have a cluster based expansion technology, according to which we don’t travel over 100-135 kms from our existing location. We are now completely present in North and West India and taking the next step towards East and then we will start covering further regions. GP: With your focus being Tier II and Tier III cities which regions are your target right now and what is your take on the audience there? LA: We are talking about the basics a person would need to live. So for us, the market is where the population is. Everyone has the right to access to food, apparel and good home and that is what we are offering. Yes the consumption power has grown; people are spending more and asking for more. People’s aspirational value is growing, so we are offering them aspirations as well. As we all know local shops in tier II and tier III markets are not upto the mark, so we are trying to offer them better quality products and shopping experience. LA: We work on 8,000-10,000 sq ft model. These stores include apparels for all, home furnishing, footwear and grocery (this is present in some stores). GP: With your expansion plan in tier II and tier III, what kind of store format are you looking at small size and more store or large format with less number of stores? LA: We are comfortable in the store size we are working in. These stores are good to offer all the products to a district of our target which has population above 20 lacs. We are available in the high street and not malls. We are not targeting stores below 7,000 sq ft as we have huge number of SKUs. GP: India has seen a lot of success stories with MBOs, so what would you put as the USP of V Mart. How do you cope with the competitive market? LA: If we speak about MBOs, they deal in brands that are popular which come with a premium pricing. We don’t target those brands, we target market brands which are not known and have our own private labels which we promote. We have a different thought process of giving value for money to consumers. We have strong sourcing and design teams which source the right product, keeping in mind the need of the consumers. GP: Do you run any loyalty programmes? What benefits do you offer your customers? LA: We have almost 18.5 lac loyal customers and we run a loyalty program for them. Based on their purchases we offer them various schemes and gifts. GP: What are your marketting and promotional strategies? LA: We try to market our brands in print media. Concentrate on BTL activities in the store, across the city. We focus more on internal branding and marketing. GP: What have been V Mart’s revenues? LA: According to DRHP, V-Mart’s total income has grown at a CAGR of 30.19 per cent from Rs 980.71 million in Fiscal 2008 to Rs 2,819.54 million in Fiscal 2012. The profit after tax has grown at a CAGR of 31.71 per cent from Rs 35.24 million in Fiscal 2008 to Rs 106.12 million in Fiscal 2012.